Paul Krugman has a truly excellent op-ed in the New York Times which should be read by anyone still doubting the need to hold the Bush administration accountable for war crimes and other widespread abuses of power committed during the past 8 years. In his concise yet effective article, Krugman acknowledges the desire held by many, including President Obama it appears, to move forward and forget about the last 8 years as quickly as possible. However, Krugman makes a compelling case for rejecting such a lack of response. Krugman notes that an investigation is necessary not only for torture and wiretapping but also for the widespread cronyism and unprecedented politicization of many government agencies. While I agree with this assessment, I would hope that war crimes would be both the starting point and the centerpiece of any investigation. This is desperately needed in order to repair our reputation on the world stage. If partisanship is so terrible, doesn't that support the case for punishing the Bush administration. After all, just look at what they did the the Justice Department! 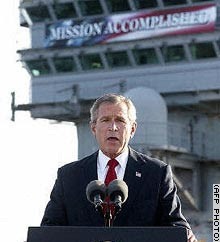 Nobody in the upper levels of the Bush administration has expressed any remorse whatsoever. How will they know that what they did was wrong if their are no consequences? The international reputation and standing of the U.S. is in tatters. Much like the golden opportunity Bush squandered after 9/11 to take the moral high ground, this is an opportunity for Obama to show the world that America values the rule of law and places no one above it. If Obama's platform is going to have any success at all, he must convince the American people that government can be a force for good in the world. By holding the Bush administration accountable for their crimes, he would send a powerful message to all Americans that this was indeed a different kind of politics. This could help restore confidence in government. Many Americans, and I count myself among them, have been demanding accountability since it was confirmed that Bush lied us into war. Lives were lost over this, and it is not over yet. Bush must be held responsible. Clearly, nothing will happen unless the American people demand it. Let's start demanding.